The first thing you're likely to feel in a paintball battle isn't an external sensation, though it's not long before that happens. The anticipation of your first bullet can manifest in an internal physical response. My reaction was somewhat stronger than pins-and-needles apprehension, but not quite so bad as paralyzing fear. My nervousness wasn't helped by the fact that I ignored the first rule of paintball (other than to wear your protective face mask, of course). That rule is: Join the team with the most guys wearing camouflage. Referees determine the teams based on the trusty "one-two-one-two" pairing-off system, which allows for some last-minute jockeying in the line. In a group of eight walk-ups, I found myself on a squad sporting no articles of camouflage. Our opponents were 75-percent camo clad. The first game we played was in the woods. When the referees started the game, I charged out of our bunker at full speed with no clue where I was going. Tripping on branches and brushing against shrubbery, together with the sound of my heavy breathing contained in my mask, I felt like an inebriated Big Foot. Bullets began flying at me from an unknown direction. I took shelter under a tree and peered out. Yellow paint pellets smacked against the bark and splattered inches from my face. I fired wildly in the direction I thought the bullets may have been coming from. I decided I was in danger and left to find a new hiding place. I didn't make it very far. I was hit on my hip bone a few inches away from center crotch. The burning skin wound lingered for a few minutes after impact and felt very similar to being waxed. In another game called "protect the fort," my team was on the offense. Our mission was to kill everyone in the large fort before they killed us. The catch was that the fort team couldn't leave the fort. During the game, I hopped some branches, with bullets flying all around me, and slid into the shelter behind some logs. I skidded and collided with the logs at full speed. In professional paintball they wear padded pants for this reason. It's been more than two weeks since I played, and my patella still is inflamed. During the fort game, I got close enough and had a clear shot of an opponent who didn't see me because his back was turned. I imagined that when the moment came, I would be incapable of pulling the trigger. My opponent wasn't much different from me, after all. He has a family, friends, a life. But in the moment, there was no hesitation; I was a killing machine. I fired. The first five shots missed, but not the sixth and seventh ones. Needing multiple bullet wounds for a better photo, my original plan was to charge the other team on the short course with inflatable shields: A kamikaze mission, no doubt. But after the waxing experience (see story this page), when I realized I could have just gotten a tiny area done and had enough to write about, I wised up. I took off my shirt and shot it 20 times instead. To quote Mr. President, "Fool me once, shame on you. Fool me twice, you can't fool me again." PBC Sports Park is located at 1680 Main St. in Rock Hill, SC. 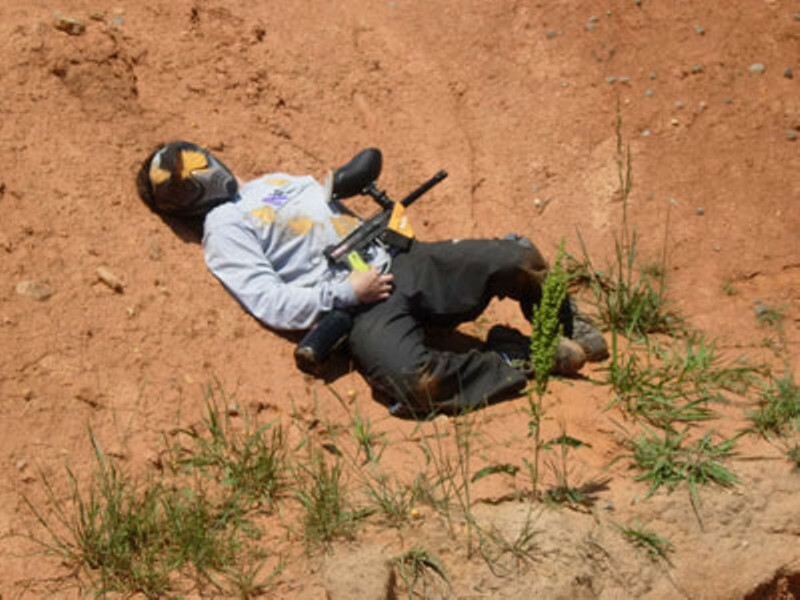 CJ's Paintball is at 1600-F Matthews-Mint Hill Road in Matthews.